women investors | Turner, Hopkins. Last night saw the fifth of our networking events, and a return to the City offices of our sponsors Thomson Reuters – and what a packed evening (and for that matter packed room) it turned out to be. 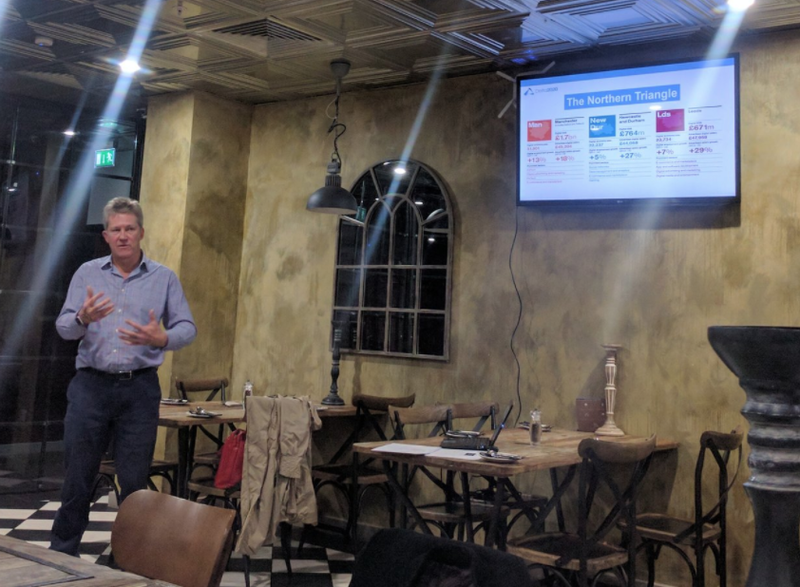 As ever, I kicked off the evening with a general introduction to the Angel Academe mission, and a round up of what we’ve achieved so far. The real step change for us came with the establishment of an investment group of around 40 angels that’s met four times since September; we’ve screened 50 businesses and 10 have pitched to us. At the time of writing we have two in the investment pipeline. Our other bit of news – which we announced here last week – is that we’re working with the City of London to deliver a year-long mentoring programme for female entrepreneurs working in the City’s neighbouring boroughs. If you’d like to enter the programme, you can apply here, and if you feel you can offer your skills as a mentor, then please get in touch here and tell us how you think you can help. I was followed by Arthi Thana, from Thomson Reuters’ Global HR IT Services team. Arthi talked about the mentoring at TH and succinctly summed up the crucial two-way nature of mentoring: “What is key to success is the level of commitment to the relationship that each party puts into it. Just showing up and shooting the breeze isn’t useful”. Quite. We then had our usual “inspirational angel” slot – this time ably filled by Angel Academe associate Kerri Mckechnie, who used a mindmap to show us how her life comprises juggling some very different spheres: being a finance director, angel investor, entrepreneur (she’s the co-founder of My Wild) and a mother. And then, of course, we had two pitches, from two very different businesses. Vicky Brock is CEO of Clear Returns. She talked us through the enormous impact that returns have on e-commerce; something like £20 billion a year internationally! 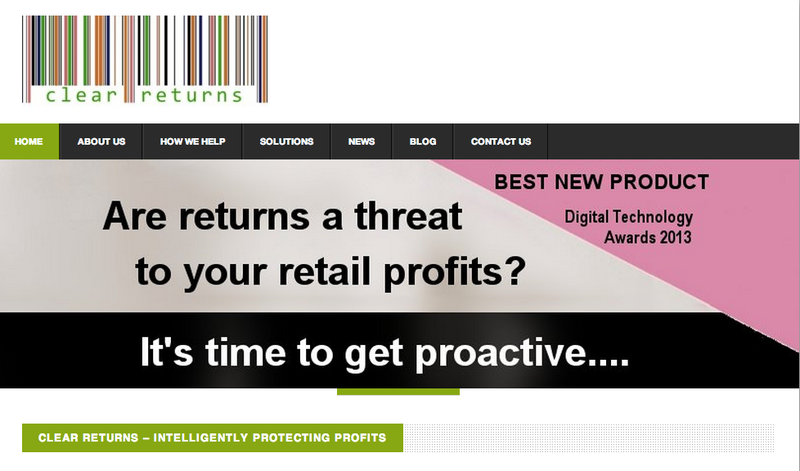 Clear Returns helps reduce this burden through the use of big data and predictive algorithms. 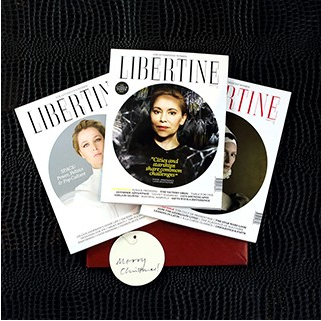 Debbi Evans is founder of Libertine, a smart magazine “for interested women” that dares to believe women might be interested in reading about anything other than fashion and beauty. Debbi is currently looking at taking the publication online and establishing it as a multimedia brand. Naturally, we finished the evening off with wine and plenty of chat. I was delighted with what a great turn out we had – and a real mix of new and familiar faces. Many thanks, as ever, to Thomson Reuters for hosting the event. We’re already looking forward to our next one on May 13th. We’ll be gathering over a coffee from 5.30 and then we’ll have introductions at 6 from Angel Academe founder Sarah Turner and Aarthi Thana, Global HR Business Partner, IT Services at Thomson Reuters. 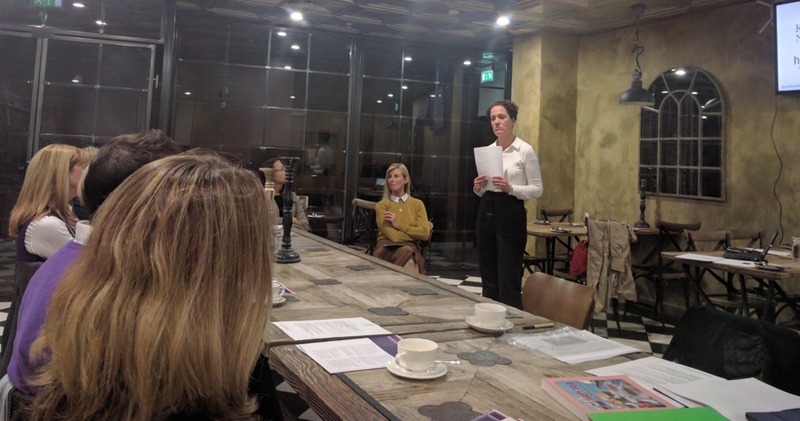 This month’s “Inspirational Angel” talk will be from Kerri McKechnie, Director at My Wild and our associate on the City of London Entrepreneur Academe programme. We’ll then have pitches from two very different businesses and entreprenuers: Vicky Brock, CEO at Clear Returns and Debbi Evans, Founder at Libertine. And of course we’ll finish off the evening with drinks and networking. If you’d like to sign up for the event head over to our Eventbrite page. Here’s an interview I gave recently to Jana Hlistova, founder and editor of SWSC, cross-posted with kind permission. Sarah Turner is director of a consulting company Turner Hopkins which consults on innovation in media with big clients like BBC, OFCOM, UK Trade & Investment. She is also founder of Angel Academe: an angel investment syndicate investing in female-led start-ups. Can you share in your professional background? A few years ago I fell into angel investing: a friend was growing his business and was looking for people to invest in it, I really liked him, I liked the team, I liked the business and got hooked on the whole thing. I don’t have a huge amount of money to invest, and I’m still relatively inexperienced, so I decided I wanted to invest as part of a group, who could pool funds, experience and due diligence. I founded Angel Academe because I identified that there was an opportunity to attract more women in the market as angel investors. Women control nearly half of the net wealth in the UK, but according to official statistics, only 5% of angel investors are women. I thought that was a very interesting opportunity and set about building an angel investment network that I wanted to be a part of: one that was collaborative and one that was mainly, but not only women; there are quite a few men in our group. One of the consequences of not having many women investing is that it makes it far harder for female founded businesses to get the funding they need. However gender blind we claim to be, I think we tend to have those biases. And all the evidence supports that. My main aim is to get more women investing, as angels, but we are hoping to support female-founded businesses through Angel Academe as well. Is there a selection criteria to join Angel Academe? And is there a minimum amount to invest? There is some regulation around running angel groups. For example, I’m only allowed to present investment opportunities to people who are either certified or self-certified as high-net worth individuals or sophisticated investors. So people need to have a certain net worth in order to invest and be aware of the risks involved. So I am targeting quite a specific demographic of high-net worth professional women, who not only have the money to invest, but have decades of experience and skills behind them. This is incredibly helpful when evaluating deals and one of the biggest advantages for businesses taking angel investment, is the skills and contacts that your angels bring. The minimum investment in any one opportunity is £10,000, and we’re looking for people to make around two investments per year. I recommend crowd funding sites for anyone who is interested in investing but is not yet at this level. Angel investment is vital to fill the gap between friends and family money and venture capital. In recognition of its importance, the government is giving investors quite generous tax breaks. The enterprise investment scheme and the seed enterprise investment scheme alleviates some of the risk for angel investors. How would you describe the angel investment and investment landscape for female-led start-ups? I think there is a lot of competition for available capital for everyone, but I also know it is even harder for women. I recently read an article by Fiona Murray, Professor of Entrepreneurship at MIT Sloan School of Management who describes an experiment she ran where exactly the same pitch was delivered by men and women, but the men were 40% more likely to receive funding. However gender blind we try to be, it is quite difficult. While men need to be aware of their biases, women can also help other women by becoming investors. For women who want to raise finance, what do you suggest is the best approach? What do you suggest women in the UK do? There are lots of things to do and none of this applies just to women. But women need to be particularly professional given the additional challenges they face. They need to be investment ready: not every business is investment ready and not every business is right for investment. Make sure you know what it takes, what investors look for, where you need to be. So speak to people who have raised money, speak to people who have invested money. Make sure you have all your ducks in a row, and be professional about it. It is important to have an investor summary. This should be short, but should cover all the things an investor needs know about your business. It should talk about your team and your track record, your product or service, and the market opportunity for it, your traction to date, what revenues you have generated and/or your user numbers. Be very honest about the competition, but make sure you explain how you are different from them. Network like mad but make sure you have an objective for your networking: go to the right events and target the right people. And ask for introductions. I tend to favour pitches that come via my network, rather than people who approach me directly. I think that most investors work on that basis. Also target investors who are a good fit for what you are doing. So speak to a lot of people but don’t be scattergun in your approach. Find the ones who would be interested in what you are doing. Look at what they have invested in before, look at their skills. At Angel Academe, I receive a lot of pitches from businesses founded by men. This doesn’t mean we won’t consider them for investment, but I do expect them to have done a bit of research and seen that most of our angels are women and we favour women founded businesses. If they don’t take the time to explain why they’re a good fit (for example, the market for the product/service is women, or they want to recruit women as non-execs and advisors), then it is clear they haven’t tried to understand what we’re about at all. Also, raise your profile, try to speak at events, try to establish yourself as a thought-leader in your area. If I’ve heard of you already, that gives you immediate credibility. Finally, if you’re asking someone for help, offer something back in return and treat it as a two-way street.